Whether you fabricate laminate, solid surface, wood, granite, or engineered stone, QuickQuote can save you time, eliminate errors, and entice new customers with faster, easier countertop quoting and drawing. 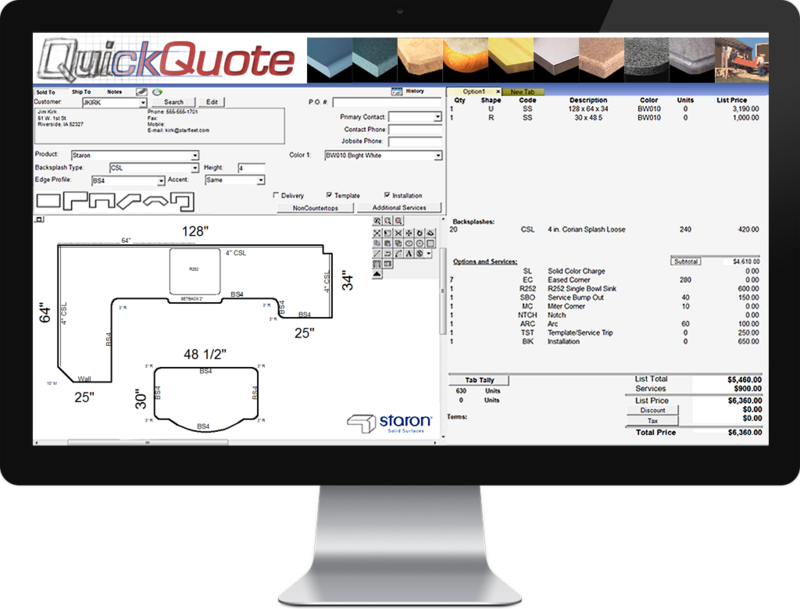 Get quoting in minutes with QuickQuote's simple, intuitive interface that automatically creates a shop-quality drawing side by side with every quote. Quote the job, pull a slab from inventory, layout your countertops on the slab, and schedule everything from fabrication to installation all in the same program. Avoid double-entry by exporting directly to QuickBooks, JobTracker, .DXF/.DWG and a variety of other formats.